I graduated from the University of Maryland in May 2015. Everything changed after that; there are more responsibilities and deadlines. Syllabuses are not included. I vividly remembered the ceremony day. The room was full of hopes, dreams and uncertainty. Everyone was laughing and hugging goodbyes, pretending everything is okay. I did not even want to go there because I felt like a failure; I was so unsure of my future. The only reason I went is because of my parents, I do not want to disappoint them. Most of my friends already received job offers. The post-graduation survey did not help either. One thing I knew for sure, I better started blasting those resumes out cause most of the students there were just as anxious and nervous as I was. Fast forward to the second week of post-graduation, I entered the “jobless crisis” mode. Literally, every job I applied to, I failed their technical interviews. I was so crushed. I tried to study and review all my materials, but my nervousness got the best of me. At that point, I was so certain that I am going to be a homeless and live with my parents for the rest of my life. My best friend was still looking for jobs back then, but he landed on an engineering job in a matter of 3 weeks. I was so proud of him, but part of me also died a little. (Does it make me a bad person just to be jealous of my best friend? I do not know, I did tell him in a way, but there is more to that, and I do not want to go into depth for this post). After applying to some 70 job applications within a two-months period, I was able to start my career as a technical assistant. This was not my ideal job, but I was willing to take any opportunity at that point. Thankfully, I was able to meet few incredible people there. They inspire me to become a better person. “Never compromise your own uniqueness to meet someone else standards, be your own ground, and stand up for yourself”. Company wise, it was a freak show: lots of political agendas and gossips. I am working in a new company for four months now. It is less hectic, people there are respectable, and my teammates are awesome. In term of relationship, I have none. I broke up with my boyfriend after I graduated from college. I put all my energy into work and work only. (There were few flings, but it did not go anywhere – I wished it would, but it never did). I might blog some relationship experience later on, but I am no expert, I am like an infant. During these times, I have learned few things about myself and my life after college. Family support and faith are the main keys that keep me going. Without these two components, I would not survive. Every rejection letter adds a drop of disappointment in my soul, luckily, I turned to my family for support and encouragement. Believing in something that is larger than myself enables me to view life differently. It makes me feels that hard work does pay off, I just need to stay focused and hone my strengths and skills. Someone will eventually notice it. This past one year and a half is a roller-coaster ride for me. With all of the craziness and loneliness, one thing I know for sure, I would not change a damn thing about my life. I am not saying this just because I am in a better place now than the day I graduated. All those feelings, experience, lessons, and emotions make me who I am today. Who knows what the future holds, but I am ready to face it. Enjoy the moment, accept defats, learn from them, and move on. There are the steps that I am still figuring out myself. I am so proud of all the people out there today doing the Women’s March . Thank you for showing supports in gender equality. I wish I could join the movement, thanks to my doctor appointment, I am stuck here watching the livestream with teary eyes. Never stop believing you are worth it. Your body, your choices. I have a love/hate relationship with time management. Part of me knows that in order to be a responsible adult, I have to understand the art of managing my schedule. Hence why I bought a gazillion planners from Target, which to be honest, is the worst place that you can go too. If people think beauty gurus spend more money on make-up products than Target, I beg to differ. Well probably, not Canadians since Target does not exist there. Anyway, I always feel accomplished when all my to-do lists are checked on my planner. Those moments makes me feel like my day has not been wasted; I contributed something good to myself or others. But here is the thing, sometimes to-do list creates a black hole in my head. It constraints me, it makes me feel like I am too structured, too “in-the-box”. And this is why I sometimes hate planning my day ahead. I want to be opened, vulnerable, and ready to take things as it is. Yes, my friends, realistic plans are the key. Do not set high expectations on what you can accomplish on a day. I have been there and done that. Trust me, it sure made you feel good, but you will not have enough energy to start the next day. Consistency will lead to good productivity. Always add extra 30 minutes to everything you need to do. For example, I usually spend 2 hours on grocery shopping every two weeks, but I always block my day for 2:30 hours so that it won’t overlap my other task. This technique will leave you the room to breath, to enjoy the moments, rather than rushing off to finish the next task on your list. Not all tasks will be completed on time. We need to accept it, and be flexible of when to change it. What is the point of writing on your planner if you never look at it again? Treat your planner (in whatever form it is) as your second mobile device, check it frequently. I highly recommend that you guys check it the night before so you can get a better understanding of how your day will look like. Depend on how much work you have for tomorrow, this can ruin your evening. I still encourage you to review it; we can not escape those tasks, either we have to do it now or later. Ok, that is all I have for today, I hope these two key points can help some of you plan your schedule better. If you have a secretary who keep all your schedules, kudo to you. The rest of you, thank you for reading my post and have an awesome day. This whole new year, new me is really screwing me over. I always want to purse my creative side, but it seems time is never on my side. I was planning to post at least two blogs per week with somewhat quality contents. Guess what? I barely made a decent one in two weeks. How is that possible?!?! Yep I am just really busy. My dad visited us last Saturday; he arrived at JFK. I had to drive to NY, but it is worth it. Cause I miss him so much, and I would do anything just to see him again. I love this reconnecting/bounding time I have with him. But I need more time. I have one post in mind, but it requires a lot of research. I do not have enough of time. I am smiling outside, slowly but surely, I’m having a little mental breakdown now. I just want to start over. 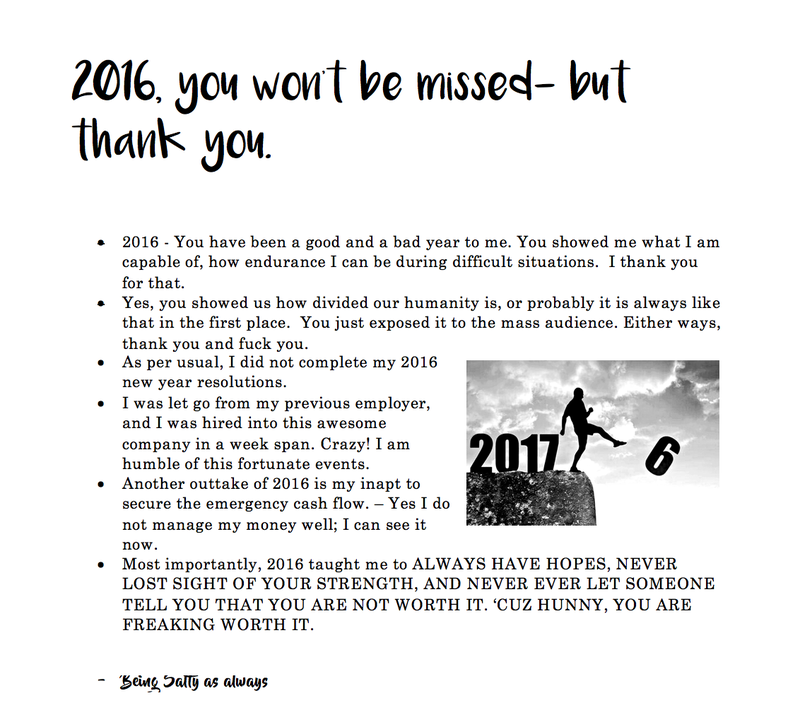 2016, you won’t be missed- but thank you. No matter what we believe in, this is America, our democracy has not died yet. Yes, we are more divided than ever before. Yes, this election validate that we have issues that we need to work on. I am at a point, where I respect America’s decision, and we must come forward as one if we want to survive and become the nation of freedom. I truly hope (and pray) that Mr. Donald Trump, President-Elect, will lead us to right path (or at least do not take America backward).